This post is for all the Rachel’s out there, all the new teachers on the front lines of teaching. 1. Show your students that you care about them – greet them at the door each day, find out what they’re interested in, use their names in your sample sentences, write notes on their desks in dry erase marker (1 a day), call their parents when they do something good (don’t tell them ahead of time that you’re doing this – students will spread the word and be psyched). 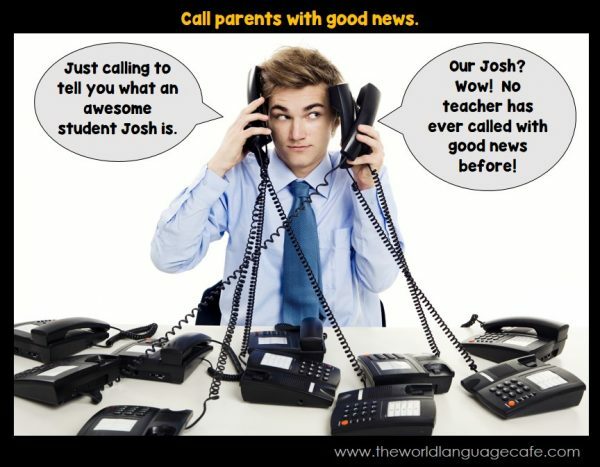 This will also win over the parents who never get called for a kid being good. 2. Pick the toughest kid in class and pretend he is the best kid in class. Ask him/her to help you with passing out papers, delivering things to the office. Whenever your tough kids do anything good, praise the heck out of them. Try to call these kids’ parents as early in the year as you can. Find something good to call about. Deep down, every kid wants to be praised and listened to. Every kid wants to matter, to be loved, and to be successful. And every parent wants a successful kid. 3. Point out the kids who are being good and try not to pay too much attention to the kids who are being bad. Write a letter to a kid who is really tough telling them that you really want to help him/her succeed and you know that he/she is a good kid. So hard to care for these kids when they continually push you away, but they are the ones who need it most. Kill them with kindness. 4. Be yourself. Let your own personality shine through. 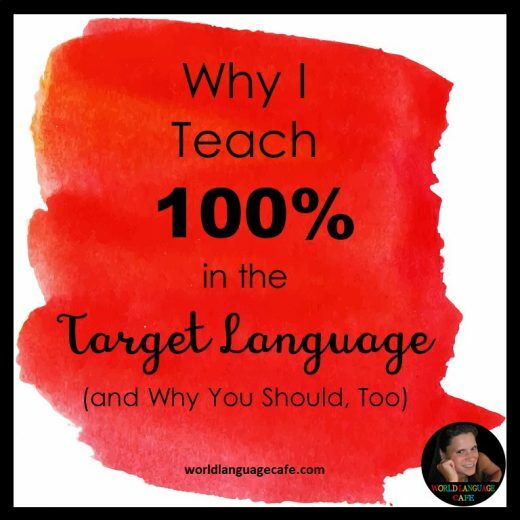 On Mondays, lead a discussion about what everyone did over the weekend (in the target language). Have the kids ask each other questions. Write down new vocabulary on the board and have them write it on the first pages of their notebooks (so they can add to it each week). They’ll get better and better at this. Have them ask you what you did on the weekend, too. They’ll love that you have a real life and are a real person. If you’re having a really horrible day (you feel sick, your dog died), let them know that and you’ll be surprised how empathetic they are. Show them the same empathy when they’re having a bad day. 5. Know that teenagers moods change very quickly. They might be in a horrible mood one day and then be completely happy the next day. You’re probably still remembering the really bad day, but they have already moved on and forgotten about it. 4. Go with the flow. Random crazy things will happen every day (but they do make for good stories – when the water pipe burst in your classroom, but you still had to teach, when the kid crawled out the window, etc.). Expect that these things will happen. Be the calm within the storm. If plan A doesn’t work, go to plan B. If plan B doesn’t work, invent a plan C. If you haven’t reached plan Z by the end of the day, you’re doing well. 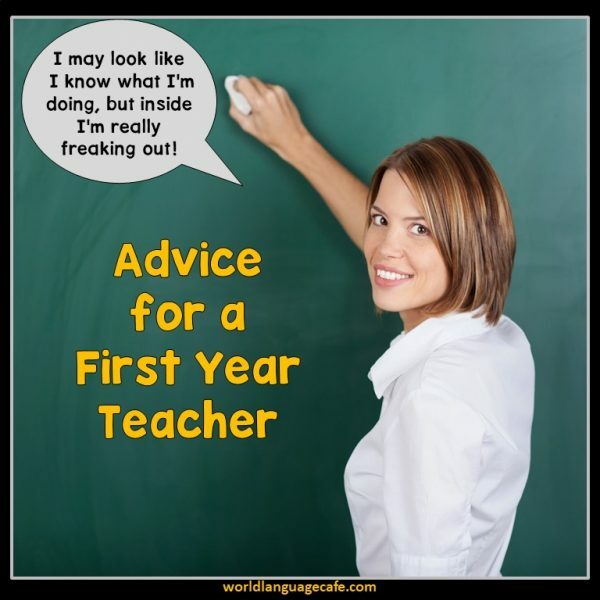 And most important of all, know that your job as a first year teacher is to survive. Each year will get better and better. Celebrate the little successes that you have and let the failures go (there will be days when your lessons don’t go well – even veteran teachers have days like that). 5. Learn as much as you can from the teachers around you. Find a really good veteran teacher to be your unofficial mentor (even if he/she is in another department). 6. Know that you have the most important job on the planet. Those kids need you and even though they might not show you they care, they will remember your small acts of kindness, your energy, and your love for the rest of their lives. 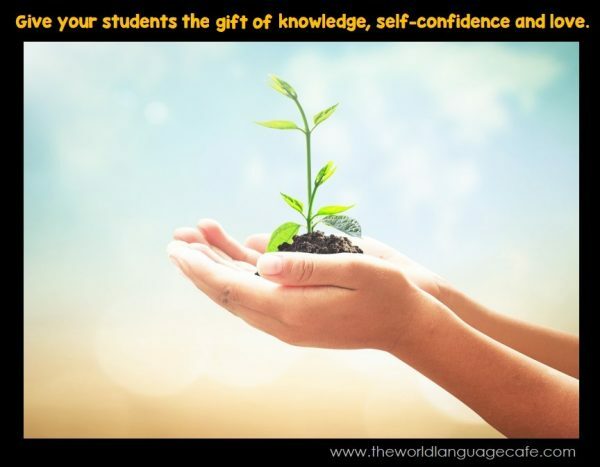 Know in your heart that you are making a difference and are giving these students gifts that no one can ever take away from them: knowledge, self-confidence, and love. 7. Write to me with any questions that you have this year. I would love to help you! 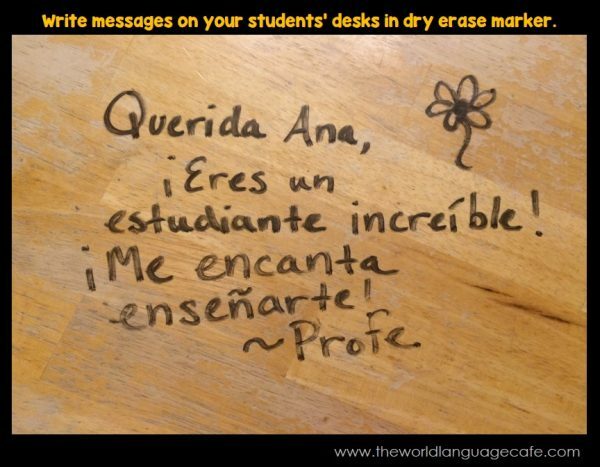 Come hang out with other World Language teachers in World Language Cafe Facebook Group where we can share ideas, tips, and crazy stories about our school years. 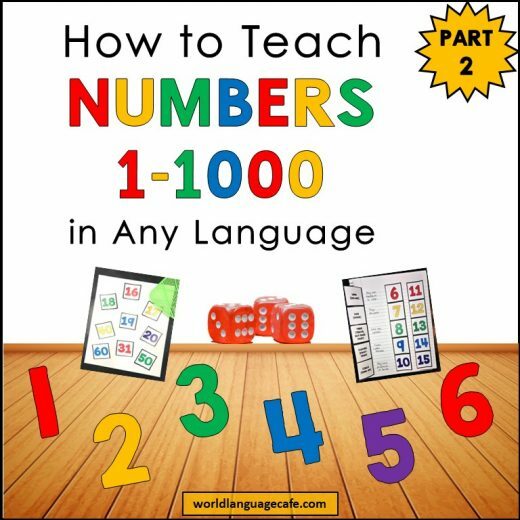 And be sure to check out my Free Resource Library – so many innovative lesson plans to inspire you all year long. Sign up at the bottom of this post. After you sign up, check your email for the password and access link. 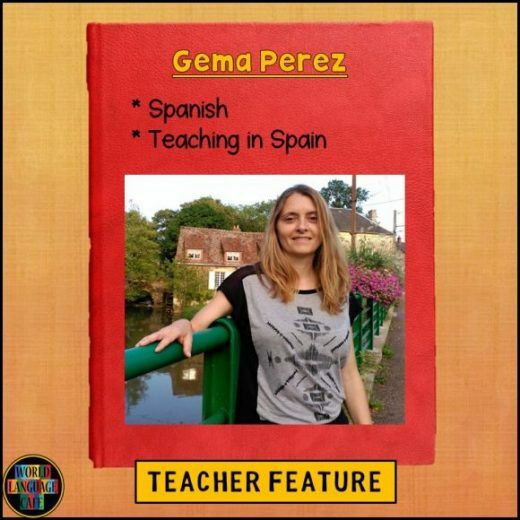 ACCESS ENGAGING LESSON PLANS IN MY FREE RESOURCE LIBRARY! Access my Free Resource Library and get 50 Free Games!